Here I am, finally back from my holidays in the South West of France. Let me show you the Halloween special nail art! 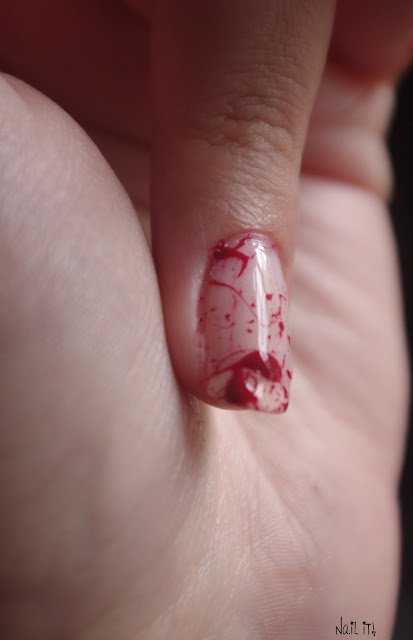 I found a nice tutorial on a special effects make up website, of a ripped nail. I had spent a long time finding everything that I needed but on Halloween, it turned out that the result was nothing like what I had expected... So, I had to improvise! 1°) Apply a base coat. I suggest a slighty white one in order to contrast the "blood". You could also choose a pinkish one. I try to avoid bright white ones as they look a lot like Tipp-Ex. Once you have the opacity you want, let it dry. I chose to spread two layers of "020 Cotton Candy at Eiffel Tower" by Catrice. It's a little bit translucent, I like it! 2°) Get a straw. I've used one from a carton of juice and cut off the curved part. Apply some red polish on one of the ends. I chose a red Burgundy-ish (HD 7 Rouge by Modelite) because the smallest splatters will be lighter than your original nail polish colour. 3°) Protect your table with some kitchen towel. If you like it, let it dry! Tip: If the splatter is too subtle, you can add drops with your dotting tool or a paintbrush. 4°) Clean your finger with some nail polish remover and a square of cellulose (or cotton). Do it before the polish is totally dry. 5°) Apply a drop of Top Coat (I chose the Seche Vite top coat by Seche). 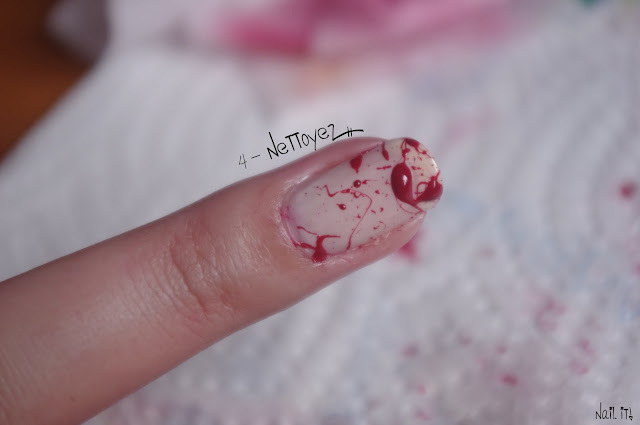 I hope you liked this Dexter tutorial. I really love TV shows, I watch plenty of them! What about you? Do you have any good TV shows that you'd recommend? Like every Sunday, Andreia and Odile Sacoche give us the chance to join the Sunday Nail Battle. No stake here, no competition, it's only a matter of suggesting a theme, looking for some ideas, making a nail art, sharing your pictures and looking at other creations. It's a really great opportunity to share and discover new techniques, ideas and above all... looking forward to the next Sunday (I know, crazy, right?)! So this is my second time taking part in the SNB, the theme this week is "Animals". I must say that I wondered all week if I would draw one or several animals, zoo animals, farm animals, forest animals... whether use stamps or acrylic paint. In the end, I chose to go with acrylic paint. I'm not very skilled with a paintbrush, rather I'm not skilled at all. I've only used this technique once, so I knew it was risky. But hey, that's who I am! Regarding the animal, I decided to pick a rabbit. Why? Well, some friends of mine and I are part of a music band, and we are currently rehearsing "White Rabbit". I think that's the reason why... Oh and I love Carroll's novels! I'll see you next week for the Halloween nail art! Have a nice Sunday, take care! I've always made a lot of effort to coordinate my outfits and accessories with my nail art. Now, I've figured out a way that you'll never have to struggle again! Why don't you make your own jewels? Yes, I almost can hear you sighing behind your screen (I insist on the "almost" here). Don't be afraid, it's not rocket science! It's even kind of addictive! I'll explain everything you need to know to make your own rings. 2°) Now you can grab a "gem" (again cf. picture #2) and put a layer of the same nail polish on it. My secret tip is to flip it and put it on a piece of sticky tape so it won't move when you put the polish on and so you won't leave finger prints all over it (cf. next picture). 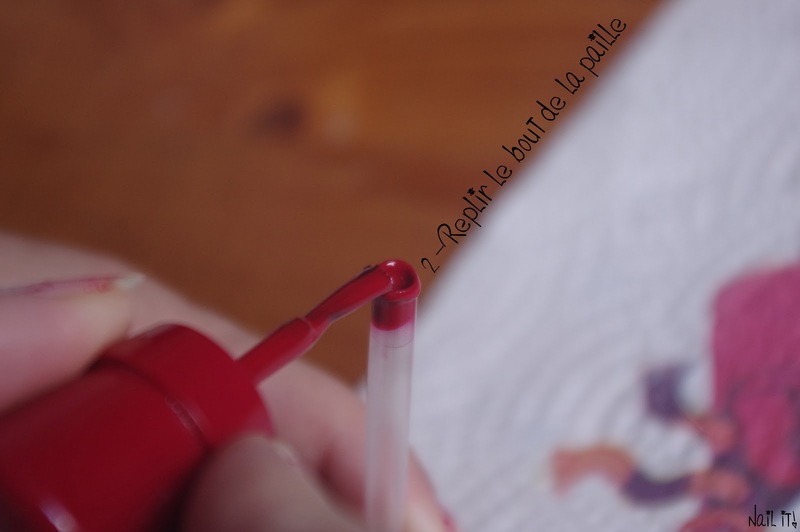 3°) When it's dry, you apply a second layer of nail polish, let it dry. If you need to you can repeat the process until you get the exact opacity. 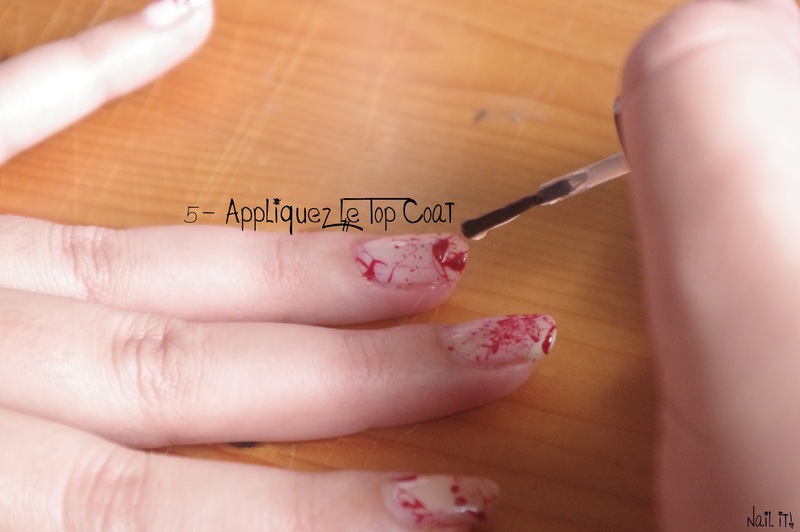 4°) Put a drop of Top Coat (not necessarily your favourite, most expensive one. 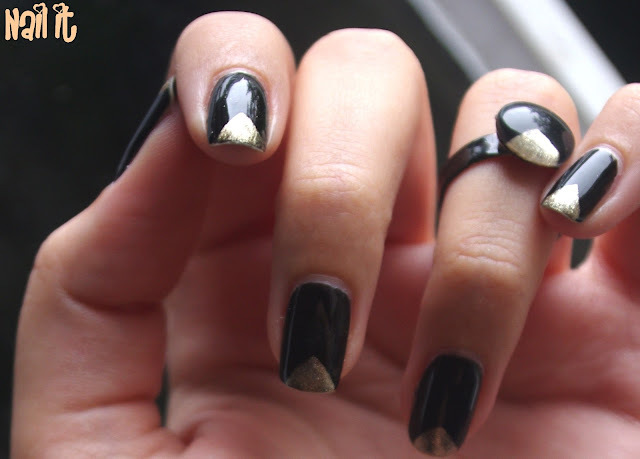 You just want to avoid a Top coat that makes ugly bubbles... well unless you want your ring to be disco-ish). Let it dry for a long time. I would recommend 1 hour (if you are as impatient as I am, you can make several other rings while you wait)! Do not check with your finger if it's dry, this will leave finger prints (disco-ish again). 5°) Now it's glue time! It's widely recommended to use some jewel glue, but if you don't have some (I don't), you can use regular glue. You put a thin layer in the center of the "support de bague". Avoid the edges so it won't go past the "cabochon" when you assemble them. Variations: You can now try this technique on earrings, pendants and make your own, unique set of jewels matching your nail art! Your turn now! Feel free to share pictures of your own creations! I hope you find this useful! Take care and see you soon!